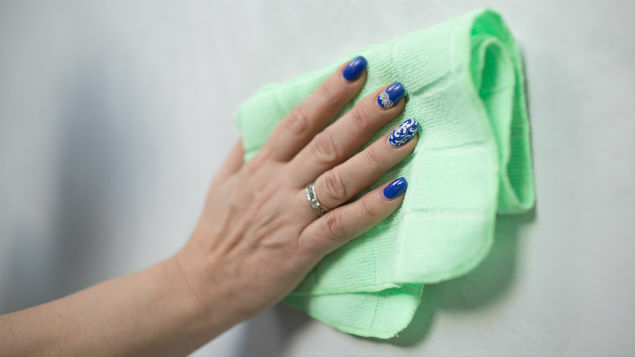 The Health and Safety Executive advises employers to replace cleaning products with chemicals that can cause COPD, or to use safer forms, such as wipes rather than sprays. 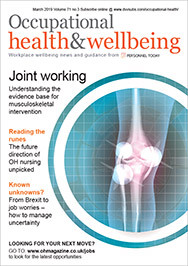 This article looks at the role of occupational health in supporting a cleaner with chronic obstructive pulmonary disorder (COPD. Sarah Holling and Anne Harriss present a case study that demonstrated current evidence-based good practice. This case study explores the OH support for Agnes (pseudonym), a 50 year-old cleaner, following a diagnosis of Chronic Obstructive Pulmonary Disorder (COPD). COPD is a condition characterised by breathlessness, being a collective term describing progressive lung diseases including some forms of bronchiectasis, chronic bronchitis, emphysema and non-reversible asthma (Russell et al, 2013). It is predominantly a disease of late onset (Sin et al., 2002), however at least half of those diagnosed are aged under 65. There is no cure for COPD, only symptom palliation (Fletcher et al, 2011). This management referral followed several short-term absences. Consent was obtained to provide a report to Agnes’ employer and to seek further information from her doctor including lung function results. Agnes had worked as a full-time hospital cleaner for 20 years. She gave a long term history of smoking (40 pack years, where one pack year equals smoking 20 cigarettes a day for one year). Pack years objectively quantify smoking history, with 20 pack years considered significant (Russell et al, 2013). Previously of good health, she had no history of atopy, skin problems or asthma. COPD is traditionally associated with smoking, but as only some heavy smokers develop the disease, other unknown individual factors may be involved (Hendrick, 2010). Airway damage may result from cigarettes containing polycyclic aromatic hydrocarbons and nitrosamines, which are significant carcinogens (Frew and Doffman, 2012). Historically, 15% of the risk factor for developing COPD was attributed to occupational causes including dust or fume exposure (Blanc and Torén, 2007). In a small percentage of younger adults, A1AD (alpha 1 antitrypsin) deficiency is a genetic cause of COPD. In chronic bronchitis the bronchioles become inflamed and clogged with mucus, impeding airflow to the alveoli. Patients are much more likely to experience hypoxia and problems from retaining carbon dioxide. Inflammation may lead to a cough, which may or may not be productive. Agnes’ cough was not normally productive. Emphysema, involves damage to the alveoli, which lose their elastic structure and collapse on expiration, making exhalation difficult (Waugh and Grant, 2010). Air becomes trapped in the alveoli, so patients with emphysema often do not experience hypoxia until late in the disease. They become easily exhausted due to difficulty exhaling, likened to trying to exhale through a straw (Koninklijke Philips NV, 2016). Both conditions affect the haemodynamic balance of the body, impeding function of all the body’s organs, not just the lungs. As patients may experience frequent chest infections (Gaduzo et al, 2015) COPD can cause repeated sickness absences, and reduced work tolerance due to reduced exercise stamina, sleep disruption, difficulties walking, eating and using stairs. COPD is increasingly seen as a multi-system disease associated with conditions including depression and heart disease (Russell et al, 2013). OH functional assessments focus on the job tasks an employee can undertake (Everton et al, 2014). OH practitioners identify potential for risks from the job/work environment, recommending return to work strategies designed to support them remaining at work. The latest Global Initiative for Chronic Obstructive Lung Disease (GOLD) also uses a functional approach, highlighting symptoms and exacerbation history (Global Initiative for Chronic Obstructive Lung Disease (GOLD), 2017). For employees working with chronic diseases, optimising their health and avoiding unemployment is crucial since they are often associated with social deprivation and worsening health (Black, 2008; Waddell and Burton, 2006). Agnes was a highly regarded employee with considerable experience. Retaining cleaners can be difficult, and consequently developing work-based strategies to keep Agnes employed as long as possible was important for all parties. Engel’s biopsychosocial approach (1977) was used as a basis for the functional assessment, rather than reliance on a medical model driven by diagnosis. This is particularly beneficial in COPD because good mental health, and support are critical to continuing to work with a chronic disease (Varekamp and van Dijk, 2010). Her case management drew on the Murugiah et al 2002 framework, retaining its original four aspects, but incorporating them into a visual model. ‘Work environment’ has been renamed ‘business context’, reflecting the need to consider the wider priorities, policies and culture of an organisation including management attitudes, sick pay, pension/ill-health retirement schemes, difficulties recruiting or retaining staff and financial resources, in addition to more established considerations such as safety. The individual is placed centrally in the model (which Murugiah et al referred to as ‘personal attributes’) with functionality added to this heading, emphasising the importance of the functional assessment. This should include psychosocial flags which aid planning by identifying positive and negative influences on rehabilitation (Watson, 2010). A new aspect, ‘services and support’, is added since the development of the original Murugiah et al model. This includes many new services now available, including employee assistance programmes, web resources, third-sector initiatives, psychological therapies and the Access to Work programme. These services should be considered in the options available when OH make management recommendations, together with medical treatment likely to be available, since speed of access to NHS services is a frequent cause of delay in rehabilitation (Hogarth and Khan, 2004). Among the individual attributes of the employee, the OH adviser should consider peer and family support, financial and social circumstances influencing successful rehabilitation. Cleaners are often found in lower socio-economic classes, subject to the social gradient of health, where the poorest often have the worst health and access to financial reserves (Marmot, 2010). Agnes had little work experience outside of cleaning, limiting job redeployment, and had insufficient company pension contributions for ill-health retirement should this be a future consideration. Her family were reliant on her earnings. Functionally, she reported a good appetite and sleep pattern, both of which can be impaired as COPD progresses. These are important contributors to overall wellbeing and rehabilitation as cleaning is physically demanding. Her Body Mass Index was greater than 30 placing her in the obese category, creating higher respiratory demands and an increased risk of developing other health co-morbidities (National Institute for Health and Care Excellence, 2010). Further weight loss planning was discussed in the consultation, positively reinforcing her progress. Depression can also be a feature of chronic conditions including COPD so her mood was discussed and non-verbal signs were observed. Agnes actively engaged with the assessment, and willingly discussed available options to help with her functional restrictions. She was clearly motivated to improve her health, having stopped smoking and started exercising several months previously, both crucial activities to slow disease progression and improve work tolerance (Gibson et al, 2013). Agnes had no significant flags impeding her work, in fact she had positive pink flags (good employer support) and enjoyed her job (blue flag), aiding the assessment process (Watson, 2010). Whilst discussing work tasks, Agnes confirmed she could walk the typically short distances needed at work, interspersed with light cleaning activities, which was corroborated by observation of her walking to the clinic room. She already used a lightweight trolley to transport cleaning materials, reducing fatigue. Climbing stairs made her breathless, but this was well managed by use of her short-acting bronchodilator as needed. Assessing stamina for normal day-to-day activities is essential when functionally assessing a job (Everton et al, 2014). Fatigue meant her husband was assisting with household tasks. Her cleaning tasks at work also involved awkward postures, and high frequency repetitive movements, each physically demanding, impacting on the cardio-respiratory system (European Agency for Safety and Health at Work, 2009). Fatigue, common in long-term conditions, is a significant risk factor for sickness absence (Varekamp and van Dijk, 2010). Consequently scope to self-pace her work would be an important adjustment. Agnes reported experiencing dizziness and varying degrees of dyspnoea. The employer provided details of the cleaning liquids and sprays she commonly used. Air quality is important with COPD, with many chemicals found in cleaning products including volatile organic compounds (British Lung Foundation, 2016). It was established that none were potential respiratory sensitisers, but one was identified on the safety data sheet as a respiratory irritant (R37/H335). The Health and Safety Executive (HSE) guidance to employers advises monitoring for COPD if employees regularly inhale mists, or vapours from R37 products (2006).They also advise a baseline respiratory health assessment on starting employment. Specific HSE guidance on using cleaning substances demonstrates the importance of training to avoid over-spraying of chemicals, and to only use these products in well-ventilated areas (HSE, 2012a). Employers must also consider the hierarchy of control when using chemicals (HSE, 2012b) such as eliminating the use of products, replacing them with safer ones, or using safer forms (wipes rather than spray), and either enclosing the process, or extracting emissions. The HSE (2016) report on COPD states that past exposure to fumes, chemicals and dusts at work will have contributed to many current cases and cites the recent Biobank Study which found a higher prevalence of COPD in cleaners of up to 50% (domestic and industrial) after excluding smoking as a confounder (De Matteis et al, 2016). The business context in which Agnes worked was also considered. She worked within a team of cleaners in a community hospital. A seven-day service was provided although Agnes typically worked weekdays with an early start and finishing mid-afternoon. An option to manage her fatigue could have been to split the working week, having Wednesday as a day off. This would, however, mean that she no longer had two full days at the weekend to rest and so was discounted. Being part of a team provided scope to re-allocate tasks including reconstituting chemicals, and ‘deep cleans’ required for some patient areas. The ambient temperature was subjectively warm. Patients with COPD can find extremes of temperatures (hot and cold) particularly uncomfortable. Working in a hospital could also expose her to patients with active respiratory infection, increasing her risk of developing further chest infections. The employer was supportive of Agnes. Positive line manager and colleague support is crucial (Kremer et al., 2006). The importance of this can be underappreciated, particularly in conditions such as COPD, where people often feel guilty and embarrassed for having caused their illness (Russell et al, 2013). The lack of resources available to support Agnes was apparent. Virtually no information was readily available about working after diagnosis with COPD, contrasting markedly with conditions such as cancer, or heart disease, and this lack of information increased Agnes’ reliance on OH advice. Lack of information on working with COPD may be due to the disease being seen as having a poor prognosis, leading to early work cessation. The employer specifically requested an opinion about whether Agnes might be covered by the provisions of the Equality Act 2010. The OH report clearly stated that her condition would have long-term effects. Whilst the final decision on the application of the Act is a judicial one, the OH adviser provided the opinion that the Equality Act was likely to apply. Paris v Stepney Borough Council (1951) established that an employer owes employees with pre-existing conditions/vulnerabilities a higher duty of care. Kloss (2010) states that once an employer is aware of such a health problem, even where a risk is small, the employer must act on this. Agnes’ employer was consequently advised to update their risk assessment, as she is now potentially more vulnerable to respiratory irritants. There is both a common law of negligence to be managed, together with statutory requirements under section 2 of the Health and Safety at Work Act etc. (1974). Additionally Regulation 3 (3) of the Management of Health and Safety at Work Regulations 1999 requires a risk assessment be reviewed if circumstances of those carrying out an activity changes. There is also the general requirement under Regulation 6 of the Control of Substances Hazardous to Health Regulations 2002 (COSHH) for a risk assessment, and the employer was advised accordingly. A multidisciplinary approach was taken since Agnes was likely to require long-term modifications. The medical report obtained from her GP provided base line information about her respiratory function including spirometry. Opinion was also sought from the Royal Brompton Hospital NHS occupational lung disease service, on a specific aspect of spirometry interpretation. Agnes was considered fit for role provided adjustments could be provided to mitigate the functional limitations identified in her assessment. This involved ethical decision making, weighing Agnes’ acceptance of risk and desire to work (combined with possible benefits of continued employment) with the responsibility of the practitioner and employer to do no harm (Litchfield, 2013). She continues to be employed without any new OH referral. Recommended actions and adjustments included reviewing the current risk assessment and product safety data sheets. Employer accommodations included Agnes self-pacing her work and having autonomy in work scheduling which helped her minimise the use of stairs. These types of adjustment are among the most popular for those with chronic diseases (Varekamp and van Dijk, 2010). Agnes was advised to avoid cleaning areas requiring over-reaching, or use of a step stool in case of any dizziness due to hypoxia. Working during the day also reduced lone working risks. It was suggested other cleaners should reconstitute cleaning products with strong odours, and where possible that Agnes should not perform ‘deep cleans’. The risk to Agnes of close contact with patients with respiratory infections, and likely future short exacerbations of her condition were highlighted, and the employer was advised to consider reviewing the use of trigger points for absence management as further short-term absences were likely. Whilst the case of Griffiths v. Secretary of State for Work and Pensions  found trigger points were not discriminatory, the Court of Appeal made it clear that this was in part due to the specific circumstances of the case. There is much to discover about the relationship between work and occupational causes of COPD (Blanc and Torén, 2016), and further evidence may emerge requiring a more aggressive approach to manage respiratory risk, with increased health monitoring. Proactive employers will be reviewing how to manage the risks in this large occupational group. Irrespective of this, with the expected growth in cases of COPD, OH practitioners will need to be confident about supporting employees experiencing functional limitations associated with COPD, and the implications for managing what remains a terminal condition. This case shows the importance of expertise in chronic condition management, and relationships with specialists, since patients with COPD are likely to experience deteriorating health requiring on-going OH input. Both sets of spirometry undertaken in OH showed normal spirometry without obstructive features, which conflicted with the obstructive picture in the GP’s results. Some patients who are symptomatic do not initially present with spirometry changes and OH practitioners undertaking health surveillance must be aware of this possibility. The 2017 GOLD Standard now categorises patients based on symptoms and exacerbations rather than aspects of spirometry results (Global Initiative for Chronic Obstructive Lung Disease (GOLD), 2017). Additionally it is possible for COPD to present with asthma. This highlights the importance of carrying out a functional assessment, with tools such as spirometry only an adjunct to monitoring. There is increasing evidence questioning traditional views of the occupations at most risk of developing COPD. Cleaners are emerging as an occupational group at greater risk from the hazards of chemicals, dusts, and fumes than previously thought. OH has a responsibility to disseminate new research and challenge views, so that managers can act promptly by updating risk assessments and reviewing control measures. Being an effective OH practitioner requires not just case management competency, but the skills to identify and evaluate research, communicate it, and the courage to challenge established thinking on health and safety practices. Sarah Holling MA, BSc Hons, SCPHN, Chartered MCIPD is a specialist occupational health nurse adviser, Ashford and St. Peter’s Hospitals NHS Foundation Trust. Anne Harriss MSc, BEd, RGN, OHNC, NTF (HEA), PFHEA, CMIOSH, FRCN, Hon FFOM is Professor in occupational health, course director OH Nursing and workplace health management programmes, London South Bank University. Black, D.C. (2008) Dame Carol Black’s review of the heath of Britain’s working age population – working for a healthier tomorrow. Blanc, P. and Torén, K. (2007) Occupation in chronic obstructive pulmonary disease and chronic bronchitis: an update, International Journal of Tuberculosis and Lung Disease, 11 (3), pp. 251-257. Blanc, P.D. and Torén, K. (2016) COPD and occupation: resetting the agenda, Occupational and Environmental Medicine, 73 (6), pp. 357-358. British Lung Foundation (2016) Your home and your lungs. British Lung Foundation (2017) What is COPD? The Control of Substances Hazardous to Health Regulations SI 2002 No 2677. De Matteis, S., Jarvis, D., Hutchings, S., Darnton, A., Fishwick, D., Sadhra, S., Rushton, L. and Cullinan, P. (2016) Occupations associated with COPD risk in the large population-based UK Biobank cohort study, Occupational and Environmental Medicine, 73 pp. 378-384. Engel, G.L. (1977) The need for a new medical model: a challenge for biomedicine, Science, 196 (4286), pp. 129-136. European Agency for Safety and Health at Work (2009) Literature review: the occupational safety and health of cleaning workers. Luxembourg: Office for Official Publications of the European Communities. Everton, S., Mogford, S., Romano-Woodward, D. and Thornbury, G. (2014) Health assessment, case management and rehabilitation, in: Thornbory, G. (ed.) Contemporary occupational health nursing: a guide for practitioners. Abingdon: Routledge. pp. 98-120. Fletcher, M., J, Upton, J., Taylor-Fishwick, J., Buist, S.A., Jenkins, C., Hutton, J., Barnes, N., Van Der Molen, T., Walsh, J.W., Jones, P. and Walker, S. (2011) COPD uncovered: an international survey on the impact of chronic obstructive pulmonary disease [COPD] on a working age population, BMC Public Health, 11(612). Available from: http://dx.doi.org/10.1186/1471-2458-11-612 [Accessed 15 May 2017]. Frew, A.J. and Doffman, S.R. (2012) Respiratory disease, in: Kumar, P. and Clark, M. (eds.) Kumar and Clark’s Clinical Medicine. 8th edn. Edinburgh: Saunders Elsevier. pp. 791-866. Gaduzo, S., Gruffydd-Jones, K., Haughney, J., Loveridge, C., Jones, R. and Pinnock, H. (2015) Diagnosis and management of COPD in primary care. 6th edn. Sutton Coldfield: The Primary Care Respiratory Society UK. Gibson, J.G., Loddenkemper, R., Yves, S. and Lundback, B. (2013) Respiratory health and disease in Europe: the new European Lung White Book. 2nd edn. Sheffield: European Respiratory Society. Global Initiative for Chronic Obstructive Lung Disease (GOLD) (2017) GOLD 17: Global stragety for the diagnosis, management and prevention of COPD. Griffiths v. Secretary of State for Work and Pensions  EWCA Civ 1265. Health and Safety Executive (2006) Health monitoring for chronic obstructive pulmonary disease (G401). Health and Safety Executive (2012a) Safe use of cleaning substances in the hospitality industry. Health and Safety Executive (2012b) Working with hazardous substances: a brief guide to COSHH (INDG 136). Health and Safety Executive (2016) Work-related chronic obstructive pulmonary disease in Great Britain 2016. Hendrick, D.J. (2010) Work and chronic airflow limitation, in: Baxter, P.J., Aw, T.-C., Cockcroft, A., Durrington, P.and (eds.) Hunter’s diseases of occupation. 10th edn. Boca Raton: CRC Press. pp. 889-902. Hogarth, J. and Khan, S. (2004) Fit for work: the complete guide to managing sickness absence and rehabilitation. London: EEF. Kloss, D. (2010) Occupational health law. 5th edn. Chichester: Wiley-Blackwell. Koninklijke Philips N.V (2016) Philips launches Breathe Boldly movement on world COPD Day. Kremer, A.M., Pal, T.M. and van Keimpema, A.R. (2006) Employment and disability for work in patients with COPD: a cross-sectional study among Dutch patients, International Archives of Occupational and Environmental Health, 80 pp. 78-86. Litchfield, P. (2013) Ethics in occupational health, in: Palmer, K.T., Brown, I. and Hobson, J. (eds.) Fitness for work: the medical aspects. Oxford: Oxford University Press. pp. 88-101. The Management of Health and Safety at Work Regulations SI 1999 No 3242. Marmot, M. (2010) Fair society, healthy lives: the strategic review of health inequalities in England post-2010 (Marmot Review) executive summary. Murugiah, S., Thornbury, G. and Harriss, A. (2002) ‘Assessment of fitness’, Occupational Health, 54 (4), pp. 26-31. National Institute for Health and Care Excellence (2010) Chronic obstructive pulmonary disease in over 16s; diagnosis and management (CG101). Palmer, K.T. and Cullinan, P. (2013) Respiratory disorders, in: Palmer, K.T., Brown, I. and Hobson, J. (eds.) Fitness for work: the medical aspects. 5th edn. Oxford: Oxford University Press. pp. 372-397. Paris v. Stepney Borough Council  1 All ER 64 (1951). Russell, R.E.K., Ford, P.A., Barnes, P.J. and Russell, S. (2013) Managing COPD. London: Springer Healthcare. Sin, D.D., Stafinski, T., Chu, Y.N.G., Bell, N.R. and Jacobs, P. (2002) ‘The impact of chronic obstructive pulmonary disease on work loss in the United States’, American Journal of Respiratory and Critical Care Medicine, 165 (5), pp. 704-707. Varekamp, I. and van Dijk, F.J. (2010) Workplace problems and solutions for employees with chronic diseases, Occupational Medicine, 60 pp. 287-293. Waddell, G. and Burton, A.K. (2006) Is work good for your health and wellbeing? London: The Stationary Office. Watson, H. (2010) Flying the flag, Occupational Health, 64 (4), pp. 30-32. Waugh, A. and Grant, A. (2010) Ross and Wilson: anatomy and physiology in health and illness. 11th edn. Edinburgh: Churchill Livingstone.